Taking your athletic facility from concept to completion can be a challenge. At Power Lift, it is our goal to make the process as seamless as possible from start to finish. Our team of experienced representatives have over 75 years combined experience in designing strength and conditioning facilities across the country. That being said, we are dedicated to working with architects and planning committees throughout the process to avoid common challenges. First and foremost, when beginning an athletic facility design, our team of representatives will work to understand what the goals are for your weight room. It is at this stage that our team will work with yours to evaluate and determine the needs of your facility such as the scope, size, population, weight equipment layout, etc. After goals and needs have been settled from the evaluation stage, your Power Lift representative will work with the necessary decision makers (architects, planning committee, etc.) to move onto the layout design. 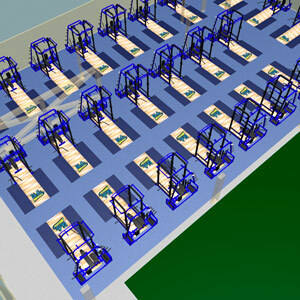 To visualize the layout and look of your athletic facility, your Power Lift representative will put together both a 2D layout and 3D layout. This will give your team a better understanding of where the weight equipment will be placed and how it will look in the space. 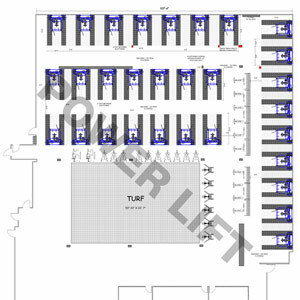 The 2D layout is a blueprint of where the equipment will be placed within the weight room. After approval of the 2D layout, your Power Lift representative will put together a 3D design that will provide a better visual with colors, logos, etc. of the weight room and athletic facility. After your Power Lift representative has walked you through the evaluation and layout stage of your athletic facility, it is time for implementation. At this point, our team will work with the individuals necessary to make sure that your weight room reflects your organizations goals. As we discussed previously, taking an athletic facility from concept to completion is not an easy feat. Learn about the most common mistakes that are made when designing an athletic facility. Power Lift’s team of strength and conditioning experts are ready to help take your athletic facility from concept to completion. For inquiries, contact us at 1-800-872-1543 or submit your request for information here.